For a more advanced and thorough guide to preflop (and postflop) bet sizing, watch The Art of Bet Sizing. Bet sizing is something that a lot of amateur poker players struggle with when they are first getting to grips with the game. If you are unable to make the correct sized bets at each stage of the hand, you will find that you will have a very big leak in your game. By being able to make the correct size bets, you will be able to maximize your wins and minimize your losses. You will also be able to give opponents bad odds to call when they have drawing hands. Bet sizing is a key skill in any form of no limit poker. How to size your bets. The size of any bet you make should always be in relation to the current size of the pot. Therefore before making any bet or raise, you should always keep in mind how much money is currently in the pot. This is because the amount you bet into the pot will determine what pot odds your opponents are getting, and so they will either be making a call with the correct odds, or making a call with the incorrect odds. Every time our opponent makes a call with the incorrect odds, we are making a profit as they are making a fundamental mistake, so it is important that we make good size bets to make sure our opponents can these mistakes by calling. Every time an opponent makes a call with bad odds, we are winning money. Tip: Betting 3/4 pot is standard. If you have a good hand and feel that your opponent(s) have a worse hand than you, you should be looking to bet around ¾ of the pot when you make a bet. For example, if you feel you have the best hand in a no limit Holdem game and the pot is $20, you should be looking to bet around $14 to $18 each time. The size of optimum bet sizes definitely varies around this area, but it's a good benchmark to aim for. This should help highlight optimum, effective and terrible bet sizes in Texas Hold'em. Gives opponents incorrect pot odds to continue with drawing hands. We get lots of value (win more) when our opponents call with worse hands. There are very few instances in poker where I would make a bet that is less than half the size of the pot. By making weak bets you will usually be losing value on your hands and giving your opponents to right odds to call and outdraw you. Strategy Link: If effective stacks are 100bb and you've got a hand you want to get all-in with on the river, you should bet close to the full size of the pot on the flop and turn due to progressive bet sizing and pot growth. When to make small bets. 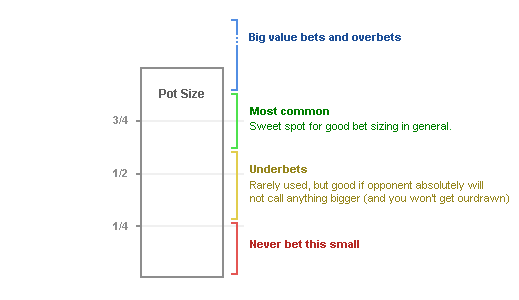 The vast majority of the time it isn't a good idea to bet small (half the pot or smaller). However, there are always going to be exceptions. The only time I will bet small is if I know that I am not going to get outdrawn and that my opponent will only call a smaller bet as opposed to a larger one. Even then, a lot of the time you'll be surprised to find that big bets are more profitable anyway. Even though there are rare instances where it can bet more profitable to bet small, you're almost always better off betting big (see value betting). Advantages of big bets over small bets. Big bets help to give us information. We never bet for the sole reason of trying to gather information, but it's often a handy bi-product. For our opponent to call, they must feel they have a decent or strong holding, or a very strong drawing hand. Therefore, this may help us to put them on a more precise range of hands. We get more value from big bets. If we feel we still have the best hand then we should continue our betting to try and extract as much money as possible from our opponents by taking advantage of our pot equity. A big mistake with bet sizing. The biggest mistake amateur players make with betting and raising is that they make minimum bets and raises when the action gets to them. If you are making a minimum raise before the flop, you will find that a large number of players will call you, as you are giving them good odds to see a flop with any two cards. As a general rule, always avoid minimum bets and raises. Either make a strong bet or don't bet at all. Similarly, if you minimum raise a player that bets into you, you will often be giving them the correct odds to outdraw you, even if you have the best hand at the time. In addition to this, a minimum bet or raise tells you very little about your opponent’s hand, as they are almost always going to call regardless of what they might be holding. Raise 3 times the BB + 1 for each limper. As a general rule of thumb, if you are making a raise before the flop, you should be looking to raise around 3 or 4 times the size of the big blind. However, if there have been a few limpers before you and you still intend to make a raise, you should add an extra bet onto the 3 (or 4) times the BB raise to prevent other players from calling with good odds. So if you are playing $1/$2 and there have been two limpers in front of you, a good $10 or $12 raise would be sufficient. Preflop raising table according to number of limpers. Bet around 3/4 the size of the pot after the flop. Raise 3 or 4 times the size of the big blind + 1 for each limper before the flop. Whenever you decide that you want to make a bet or a raise, you should always take a look at the size of the pot before moving that chip slider or before counting out the chips in your stack. It is important to reduce the odds your opponents are getting and to maximize the value from your hand by making good strong bets. By making weak bets and by playing passively, you are leaving yourself open to being run over by your opponents when they have far weaker hands than you. So make sure you stand your ground, and make healthy bets into the pot at every opportunity to let your opponents know that you are not a player to be messed with.